Walk to Lifts, Fish From Backyard! 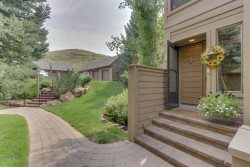 Sitting at the base of Bald Mountain on 150 ft of Warm Springs Creek, this stunning 4 Bedroom / 4.5 Bath Lodge style home is perfect for your next Winter or Summer Sun Valley Vacation. GREAT ROOM: Engulfed in natural light from the Floor-to-Ceiling Windows, the great room encompasses the gourmet kitchen, bar, dining and living areas with several access points to the wraparound deck. LIVING AREA: The living area is centered around a dramatic Wood Burning Fireplace and Flat Screen TV with plenty of comfortable seating on oversized chairs and couch. DINING AREA: The dining area seats 10 at a long table adjacent to the living area..
GOURMET KITCHEN: The gourmet kitchen is a Chef's dream, fully equipped with a 60" Wolf Range, 2 Ovens, and Stone Counters. BAR: Next to the kitchen, the separate bar is a great spot to relax and entertain. GAME ROOM: Upstairs, a game room is complete with a TV, Pool Table, Fusball, and Built-In Bar. DECK: Lastly, listen to the burbling sounds of Warm Springs Creek on the wrap-around deck and veranda with a built-in Gas Grill, Fireplace, Private Hot Tub, and large Yard. Pet friendly based on owner approval only. A local favorite, the Warm Springs area of Ketchum offers guests fantastic Skiing on Bald Mountain, Fly Fishing, Hiking, Biking, and Natural Hot Springs. Only 2.5 miles from the Warm Springs Lodge, Downtown Ketchum is easily accesible by Free Shuttle, Bike Path, or Car.